This first segment reports what researchers discovered about the accuracy of telomere length studies, the role of telomeres in maximum human lifespan and the accuracy of using them as a biomarker of aging. In a comprehensive study published a little more than a week ago in a highly respected journal of the Royal Society, authors Aviv and Shay nail down the answers to puzzling questions regarding telomere length and human aging and health. The Royal Society is the highly-respected national science academy of the United Kingdom, with a fellowship of the world’s most eminent scientists. Authors Aviv and Shay perform an exhaustive review of the literature to provide a comprehensive look at the role of telomere length in chronic human diseases, such as cancer and the reliability of telomere length studies and their use as biomarkers. Aviv is with the Center of Human Development and Aging, at New Jersey Medical School at Rutgers, The State University of New Jersey. Shay is with the Department of Cell Biology at the UT Southwestern Medical Center in Dallas, and also with the Center of Excellence in Genomic Medicine Research at King Abdulaziz University in Saudi Arabia. Why Do We Need Telomeres Anyway? Looking very much like the plastic tips on the ends of shoelaces, telomeres are the protective caps on the ends of all human chromosomes that protect our genetic data. Broken chromosomes cause all sorts of trouble and trigger ill health. Moreover, telomeres act as a biological clock in our cells. In healthy aging, each time a cell divides, its telomeres get shorter, until the cell either becomes senescent or undergoes a form of cell death. Geroscientists link inherited short telomeres to a variety of human disorders, including pulmonary fibrosis, aplastic anemia, dyskeratosis congenita, and cancer. 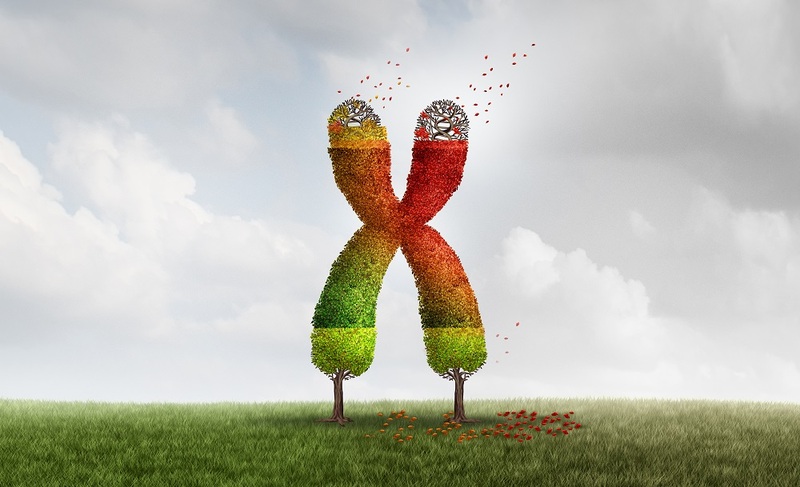 In addition to these rare genetic disorders, researchers link short telomeres in the general population to several common chronic diseases, such as diabetes, cardiovascular diseases, hypertension, and dementia. Telomeres protect the genome. Telomere length is a way of keeping track. Credit: ttsz / Getty Images (iStock). 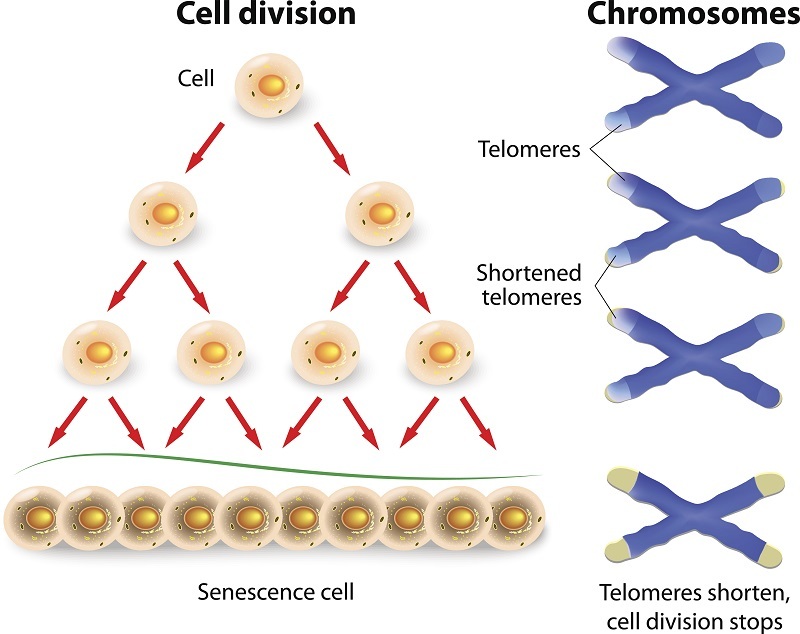 telomere shortening, some cells use the enzyme telomerase to maintain telomere ends. Ordinary cells don’t use telomerase and only human stem cells, reproductive cells, and cancer cells use this enzyme. Because telomeres grow shorter as we age, scientists suggest using telomere length as a way to measure accelerated aging in individuals, a condition where a person’s biological age is older than their chronological age. Using telomere length as a marker of biologic age is an attractive idea, however, is plagued by many sources of variance which limit its reliability, say Aviv and Shay. In the study, authors Aviv and Shay (A+S) convincingly argue that most epidemiological studies of telomere length are grossly inaccurate, for several reasons. The majority of the telomere length studies were performed only on adults, omitting children. The studies were conducted mostly on Europeans, excluding, for the most part, the other races who outnumber them. Lastly, say A+S, the studies were too small to overcome measurement errors. According to Aviv and Shay, the overwhelming majority of epidemiological studies were performed on adults, and the vast variation in telomere length is observed before adulthood. Moreover, most genome-wide association studies (GWAS) of telomere length were performed on Europeans. These studies that omitted non-European populations failed to capture the role of the interaction between genes and environment in setting the optimal telomere length and its potential role in longevity and the chronic diseases of aging. Telomeres are often considered as biomarkers of aging and people with short telomeres are considered biologically older than their peers because their clock is ticking at a faster pace. Researchers have found that psychological stress, as well as free radical damage, accelerate telomere shortening and studies link telomere shortening with chronologic aging. Telomere damage is a type of macromolecular damage and too much of it induces cellular senescence and cell death. Researchers don’t know if telomere shortening is a symptom of accelerated aging or a cause of it. Geroscientists traditionally regard telomere length as a biomarker of human aging, however, Aviv and Shay say it is a poor indicator of chronological age. Telomere length has also fueled the field of telomere epidemiology to identify people whose biological age is out of step with their chronological one. The vast majority of studies that measure telomere length of only the white blood cells called leukocytes, which are far easier to measure. In other words, the telomere length of leukocytes is used as a proxy for the overall telomere length of the other cells in the body. In fact, the terms telomere length is a stand-in for “leukocyte telomere length” throughout the rest of this report. Aviv and Shay are confident that telomere length is highly inheritable, and telomeres are longer in females than males. Moreover, telomeres are longer in individuals of African ancestry than those of European descent. Interestingly, A+S say that telomere length is also longer in offspring conceived by older men. Aviv and Shay say that telomere length could impose a maximum lifespan on humans. All somatic cells can divide a limited number of times before the stop, a phenomenon known as the Hayflick Limit. Cells hit this limit when their telomeres reach a critically short length. The average cell will divide between 50-70 times before cell death, but varies depending on cell type. Many cells are nowhere near the Hayflick Limit in older adults. Given the wide range of fluctuation in inherited telomere length, combined with measurement inaccuracies in epidemiological studies, telomere length is a poor biomarker of aging. A+S suggest that to effectively use telomere length as a biomarker of aging for a particular individual, one would have to obtain a baseline reading at birth. These inaccuracies also cast doubts on other studies which use telomere length as a biomarker of the chronic diseases of aging. Future studies with better accuracy will be required to better use telomere length as a biomarker of chronic disease. Part 2 on the role of telomere length in cancer is here. Part 3 on the role of telomere length in chronic diseases is here. This article is featured in the best of telomere reports series. The problem with the diagram in this post is that it is too simplistic. It ignores what we know about the stem cell basis of metazoan tissue development and maintenance, mammals in particular. Because long-lived stem cells are responsible for the asymmetric renewal of relatively short-lived mature tissue cells, what really matters for telomeres in aging mechanisms is what happens to their lengths in tissue stem cells. Now, since tissue stem cells have been shown to undergo non-random, immortal DNA strand co-segregation both in vitro and in vivo, there is a strong prediction (first noted by Christopher Potten) that their telomeres either do not shorten, even in the absence of telomerase, or they shorten at a much lower rate than the rate expected for cells dividing as depicted in the diagram with random sister chromatid segregation. Unless our aging hypotheses are more comprehensive of such complexities, we are not going to discover how to delay or reverse human aging processes. Tell Calico to call Asymmetrex. Hi – it’s a stock photo, so it is simplified.